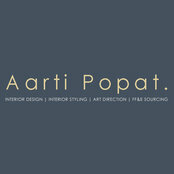 Aarti Popat Interior Design is a leading design studio creating contemporary, eclectic and stylish interiors for high-end residential and boutique commercial clients. With more than a decade’s experience in several prestigious international design agencies, Aarti combines her knowledge and expertise with her passion for travel and culture. Every project she undertakes is completely bespoke – sensitively designed and curated to suit each client’s vision and aesthetic. Armed with her industry-wide contacts list, specialist artisan connections and skill at putting spaces together, she delivers unique, intricately layered interiors packed with personality.